I've made a list of the beautiful and fantastic looking animals in the world. You can check them out if you want to see pictures of them. These are just a few of the strange animals I could find but wanted to give highlights to some of them on here. There are far more strange fantasy looking real animals out there, but here is just twelve of them. 1. The Tibetan Sand Fox - A rare species of fox that lives in high regions of Tibet, with unusual colourings of red and silver. These foxes have larger teeth than most other foxes, with wolflike features and narrow eyes. Their choice of prey varies from mice to larger animals such as antelope. 2. Long Eared Jerboa - Small fluffballs of cuteness with very big ears and long legs, these mice creatures are nocturnal. They leap around in groups and live in deserts found in Asia. 3. Panda Ant - The black and white fluffy insects are not ants, but types of wasps even though the name is pretty misleading. The female panda ants don't have any wings. They all prefer darkness and live on nectar. 4. Honduran White Bat - These tiny little white bats resemble snowdrop flowers as they huddle underneath leaves. From rainforests, these types of bats prefer the beds of warm fresh leaves and eat fruit. 5. Glaucus Atlanticus - Unusual tiny sea slugs in colours striking blue and white stripes. They've got appendages that resemble outstretched wings. They can sting. 6. Shoebill - Very large African bird with massive bill and silvery blue colourings. They don't fly fast and have short migration patterns. They're often quiet and tend to interact with humans well. 7. Axolotl - An amphibian from South America that looks almost like a tiny human infant except with a tail and gills. The babies are all cute with smiling happy faces. 8. Venezuelan Poodle Moth - These unusual moths look like Pokemon with large eyes and cuddly fluffy bodies. The appear like tiny dolls wrapped in thick clothes and their large eyes making them look like kittens. Their antennae resembles tall ears. 9. Tapir - These strange large mammals have short elephant like trunks and pig like bodies. Some have a mane, others don't and have stripes or two colours. There are many species of them from South America to Asia. Herbivorous who love swimming in tropical waters. 10. Armadillo Girdled Lizard - These lizards are gold coloured with spines, that tend to fold into rings. They come from Africa and live in rocks. Females of the species give birth to babies instead of laying eggs. They eat plants and insects. 11. Mirror Spider - Small spiders with gorgeous bodies that look like sparkling crystals, the spiders resemble pieces of jewelry than spiders. Found in Australia, the spiders have bodies that reflect light and colours to protect them from predators. They live mainly in trees and bushes. 12. 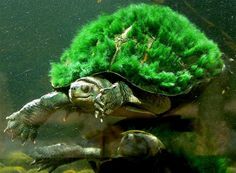 Mary River Turtle - The most fantastic and amazing kept for last. These large turtles look as if they've come straight from a magical world. They glide in water but they can have green hair that looks like grass, they come from Australia.